The Walt Disney Company’s announcement earlier this week that they had purchased Lucasfilm for over $4 billion and were planning a new Star Wars trilogy beginning in 2015 was greeted with few reactions that ranged anywhere near the positive. 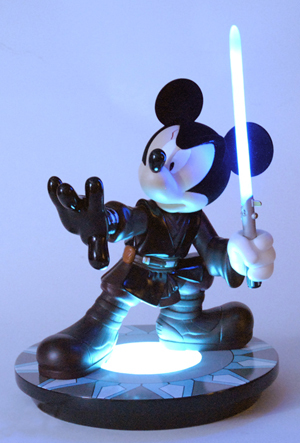 Amidst the fanboy laments and snarky photoshops of Mickey Mouse wielding a lightsabre or Princess Leia donning a Mickey cap, there were more thoughtful treatments of what it all meant, notably from Andrew O’Hehir at Salon, who sees the move as foreshadowing dark clouds for Hollywood with a potential aesthetic silver lining, the latter implication of which I’ll consider further in a moment. 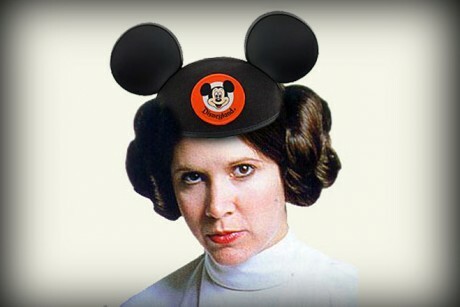 But I was going to Tomorrowland to ride Space Mountain, it’s not fair! What the announcement truly brought home was a truth that the multiple generations of Star Wars devotees have long denied, but is now unmissable. Whatever fans may wish to believe in order to validate their investment in George Lucas’ sci-fi/fantasy universe, it cannot be ignored now that Star Wars is now much more a corporate brand than a mere cinematic creative framework, and that Lucas’ legacy over the past three decades or so has been to shepherd his film creation into a product of mass consumption. The sale to Disney, a company whose own commodification of their creative products was the 20th Century gold standard of the form, makes perfect sense in this context; it was a match made in corporate heaven (or is it haven? ), in this way. As I have written about before, the high level of investment and engagement that Star Wars fandom displays leads to a sense of symbolic possession of an entertainment product that is, in fact, a highly-protected piece of corporate ownership. Many Star Wars fans continue to prefigure their judgments on every new development in the franchise on the assumption that the galaxy far, far away belongs to them, the audience that embraced it, and not to its increasingly out-of-touch creator. Will this feeling become modified by this blatant exemplification of capitalist dominion over their beloved series, particularly by a conglomerate best known for family-friendly cartoons (but which has extended into richer and more adult fare through several company arms at various times)? Or will the wounded sense of dedication to the Jedi ideal become that much stronger for rebellious fans now that the House of Mouse, a veritable evil Galactic Empire for many, is building a new Deathstar? The Lucas of George looks mildly uncomfortable, no? That I do not share this perspective should be immediately clear. My point of view lies closer to O’Hehir’s, having enjoyed the original trilogy with some geeky enthusiasm but hardly with an all-consuming passion, and being distinctly unmoved by the messy and unfeeling prequels. To whatever extent I might think the Star Wars franchise framework has anything to offer film-goers, I doubt that George Lucas is anything resembling the filmmaker to give it to us anymore. Handing the reins over to a younger filmmaker with a passion for the universe (maybe J.J. Abrams, who has already made a Star Wars film in another sci-fi franchise, or perhaps Joss Whedon, an established geek god and director of recent superhero megahit The Avengers for Marvel Comics and Disney) would be the best thing that could happen to Star Wars at this point, and might even see the franchise rise back to something approaching its original creative pinnacle, if not higher (probably not higher). I would feel more confidence in something like this happening if, say, Warner Bros. (who cultivated a superb collection of cinematic artisans through the course of the Harry Potter movies) had made the purchase, but then Disney did turn Gore Verbinski and Johnny Depp loose on those films based on an amusement park ride, so there’s a track record to draw upon, at least. Still, this is mostly a news story of multinational media conglomerates combining brand names, which is as clear a sign as any of profit-driven corporate capitalism’s complete co-opting of American popular culture. As if they could exist without each other in the first place.